I’m not sure if it’s grammatically correct to say this but we had several “firsts” this past weekend. It was such a fabulous weekend as we had nothing planned. On Saturday, I woke up and was ready to try something new with baby Lola. She LOVES her bathes so I figured she’ll probably love hanging out in the pool. 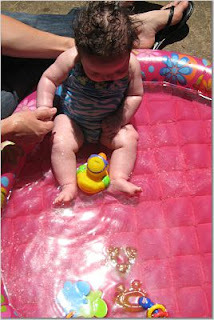 So, I blew up her baby pool, got some toys ready and put Lo in her little swimming suit. We were ready to tackle Lola’s first swim and I was so excited! Well, as you can tell from the pictures, it didn’t go so well. Poor baby girl. I think it was a combination of things. One, it was too bright outside and two, she can’t sit up on her own yet so it just wasn’t any fun for her. Oh well, we gave it a shot. We’ll try it again in a couple weeks. Moving on to the next “first”. As noted in a blog below, Lola flipped from her stomach to her back a while back. Well, this past weekend, baby girl flipped from her back to her stomach and then got up on her arms. Yea!!! We were so proud of her. I know, I know….It seems crazy to get excited over something that seems so little but in “baby world” this is a huge deal so we were proud parents. Now to the next “first”. This one is a little disappointing and has nothing to do with Lola. Clay asked me to get my own toothbrush. I should back up a little so you can better understand the significance of this. I have a tendency of using other people’s toothbrushes. Really, I limit this great honor to family only. For example, if I’m staying at my parents, I don’t take a toothbrush b/c I know I can use theirs. Not a big deal right? I didn’t think there was anything wrong with this until I used my sister-in-law, Molly’s, toothbrush and she was pretty much appalled. After thinking about it, I guess you are taking germs off your teeth and maybe others don’t really want my germs on their toothbrush. Understandable for family members to feel this way but my husband….I was in shock and a little sad. I mean seriously, we’ve been together for almost 14 years and we’ve made a baby together so why in the world would it be a problem to share a toothbrush? Well, apparently, he’s ready for me to move on and get my own toothbrush so I’ll be on the search for that perfect brush this week.